DISCIPULUS: How Were These Topics Discussed on the Day? Home » News » DISCIPULUS: How Were These Topics Discussed on the Day? Following opening addresses by the PI of DISCIPULUS (Dr Vanessa Diaz) and the Facilitator of the Meeting (Isabelle Read), each clinical challenge was presented by a clinician who was a recognised expert on the condition underlining the challenge. 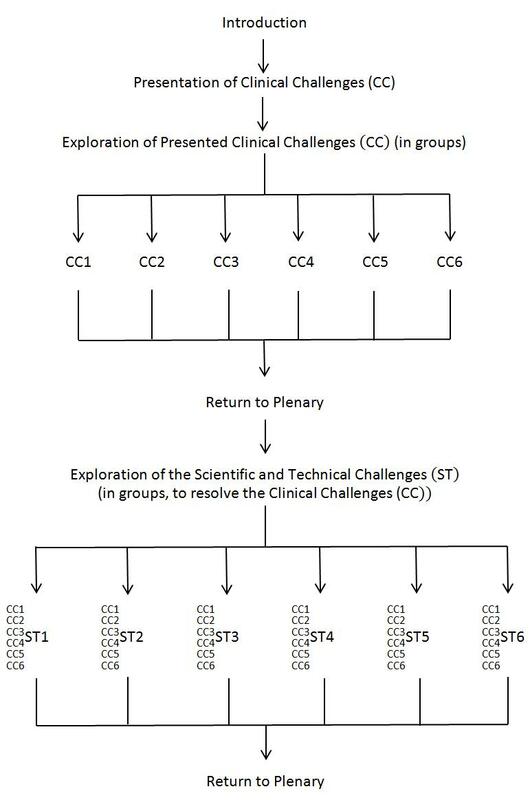 After presentations of all the clinical challenges, the attendees were divided into six groups with each group uniquely representing one of the clinical challenges. During this session, attendees were encouraged to ‘dream of the future’ and make predictions for 2017 and 2032. As Ms Read put it to the attendees, “What will we be saying in 2032 that we are not saying now?” Attendees were encouraged to put their ideas on large post-it notes and paste on to a large board. Almost all the clinical challenge groups were fairly optimistic about the future for the conditions underlining their respective challenges, and almost all explicitly predicted that there would be some form of functional Digital Patient by 2032 (and the language then would reflect that). Most of the groups were clearly positive about living longer lives, however, in the case of the dementia group, the experts stressed that not everyone could live optimally to the same age as health deterioration has a rapid evolution after a certain point in life. They highlighted though that the Digital Patient has a role to play in helping us identify what that point in life is for each individual, which will in turn enable us to act accordingly. For 2017, almost all the groups forecasted more sophisticated, better, and more efficient data systems. It was highlighted that in some areas there was still a lot of fundamental research to be done, such as early detection of high risk groups,in vitromodels, and optimising therapy, however, the consensus was that with the aid of VPH models, significant progress could be made on many of these basic questions by 2032. After this break-out session, a plenary session followed (with lunch), and after that, there was a second break-out session, but this time, along the six scientific and technical challenges. Each scientific and technical challenge group had at least one person from each of the earlier clinical challenge break-out groups. For the second break-out session, in each scientific and technical challenge group, the attendees in the group organised themselves into smaller groups of two to four, in most cases, each small group represented one of the earlier clinical challenges. In these small groups, the attendees had to identify the issues that would need to be addressed if the future that the attendee had envisaged in the earlier clinical challenge session was to become reality.